Experience the allure of the Australian seaside holiday lifestyle at Sea Point Ocean Apartments, perched on the scenic Headland of Shelly Beach, Caloundra on Queensland's Sunshine Coast. Dream the world away from your own private balcony, with panoramic ocean views extending as far as the eye can see from Moreton Bay & Bribie Island to the far northern beaches of the Sunshine Coast. Our Sea Point Apartments are popular with all age groups, singles, couples, families, & retirees. Spacious fully self contained ensuited unit with balcony & ocean views. Relax and enjoy the morning sun on the balcony while watching the passing ships. 2 bedroom unit with balcony & ocean views overlooking the shipping channel. Spacious fully self contained ensuited unit with garden and water views. Relax and enjoy the the morning sun on the patio while watching the passing ships. 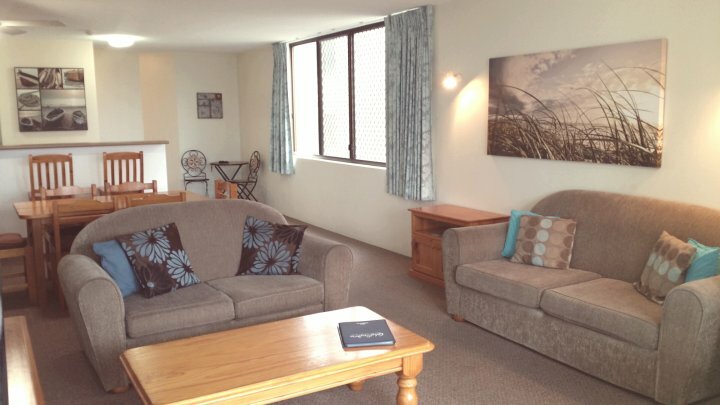 Spacious fully self contained ensuited unit with balcony & panoramic ocean views. Relax and enjoy the morning sun on the balcony while watching the passing ships. Spacious fully self contained ensuited unit with balcony & ocean views. Relax and enjoy the the morning sun on the balcony while watching the passing ships.